Didn't get much sewing done this weekend, my baby is sick. Took her to the doggie Dr. For an exam and a mega $$$ ex ray and there is nothing stuck in her throat. Either she has kennel cough or an irritation in her throat. She was playing with one of her real bones and it splintered into couple pieces. I promptly took it away, but when she started acting weird a few days later, I figured it was time for a trip to the Dr. 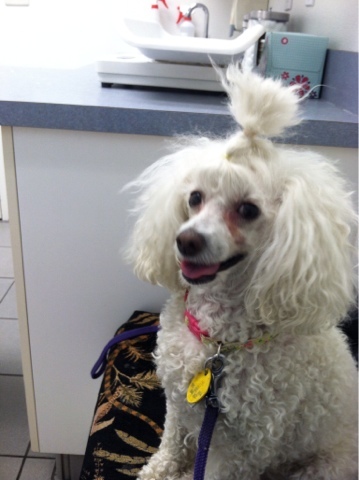 Here she is at the Dr., looking happy as a clam. It's hard to convince someone your sick when you are running around and wagging your tail!!! Anyway she has some meds and will be just fine in a few days. Then we can go back to agility class. 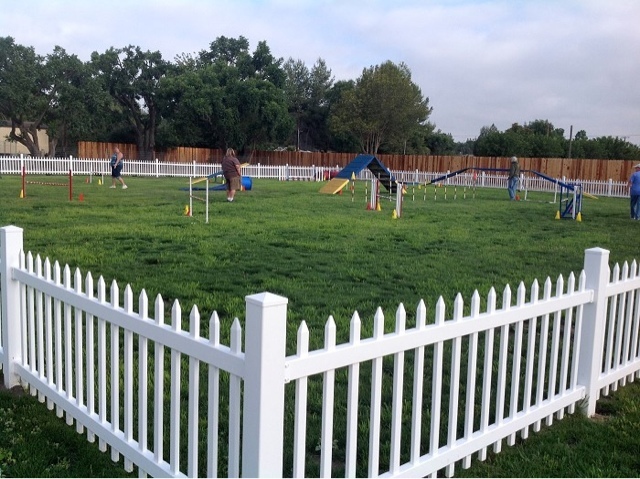 Here is a picture of our local class course. I'm in the far left, getting the lay of the land before we run it. So this is what we will be sewing today....looks like it is going to mild and cool here in so.Ca, which is a bit unusual for summer...but we'll take it!! Underground Railroad blocks. 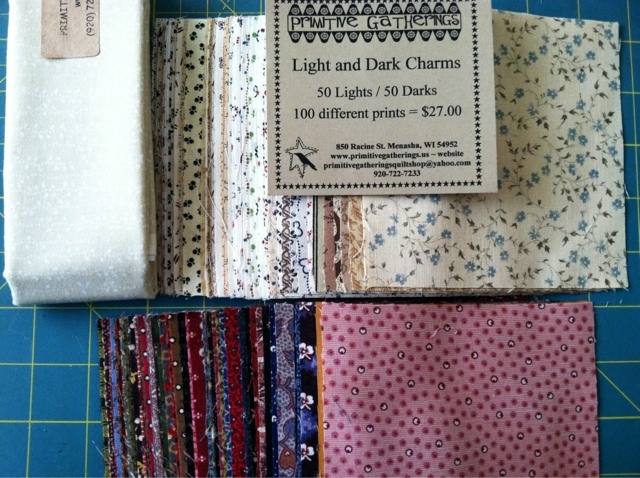 These are 3.5 inch blocks, which I am adding the sashing and corner squares. It is slow going when I am trying to get all these corners to meet up. I had some issues and learned a few tips to myself along the way. 1. Take notes of what settings you use on your machine to make th 1/4 inch seam. 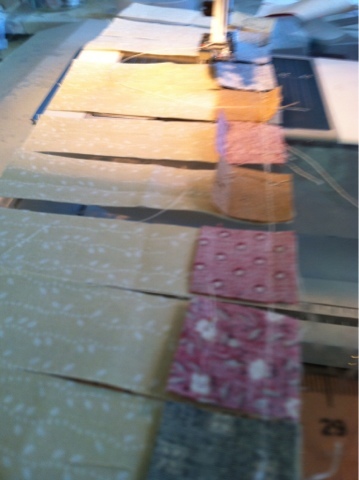 I have a setting on my machine but recently started going 1 spot over to create scant 1/4 inch. Unfortunately with these little pieces and the time frame I have been working on this project, it turned out that 1/2 had the new seam and 1/2 the old seam allowance. Ugh, I wanted to tear my hair out with the seam ripper!! 3. Don't make the iron too hot. Starch scorches easily.....I think it's going to make the whole thing more antique and I'm not giving up. I did learn that you can use a piece of toweling with white vineger, soak the cloth, put over scorch mark and heat with iron. This will remove it, may take more than one time. 4. Pay attention to the pattern and make sure the block I'd right before making another 10 of them. Yes I did that too!!! 5. I'm really great with the seam ripper. I use a clover one that is like a little curved knife. 6. Take a break when you are frustrated, go do something else for a while. Much better to enjoy the process. 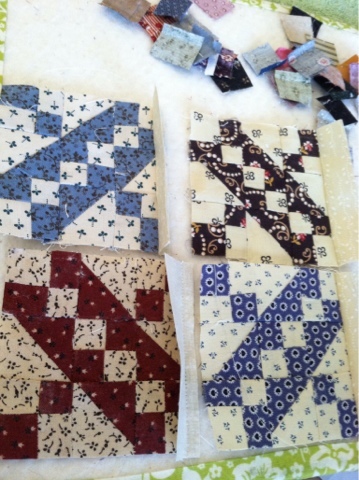 your Underground Railroad blocks are looking great, Kristin! Thanks for sharing all your tips on making them.